Every car that has been on the road for more than three years is required by law to undergo an annual MOT test. MOT tests are carried out to ensure that your vehicle meets the VOSA road safety requirements. At Elm Tree Garage, we have a team of specialist technicians who are highly experienced in MOT testing a diverse range of vehicles. We can provide comprehensive MOT tests for both private and light commercial vehicles, including small vans and minibuses (up to 16 seats, 4.5 metre(14ft10") wheelbase and 5000kg) and Motor Homes (up 3500kg and 4.5 metre(14ft10") wheelbase). We MOT classes 4, 5L and 7. The law requires that everyone who uses a vehicle on the road must keep it in a roadworthy condition at all times. Once a year, roadworthiness is checked in the interests of road safety and the environment by the test we know as the “MOT”. The first test is required once a car is three years old. (There are different rules if you use it as a taxi or if it has more than 8 passenger seats). It should be clearly understood that the MOT is a minimum standard which your car should meet at all times; it is not a standard you should bring your car up to once a year. The MOT looks at some important items on your car to see that they meet the key legal minimum requirements at the time of test. You should be aware that the MOT certificate is not a guarantee of the general mechanical condition of a vehicle. What is included in the MOT test? 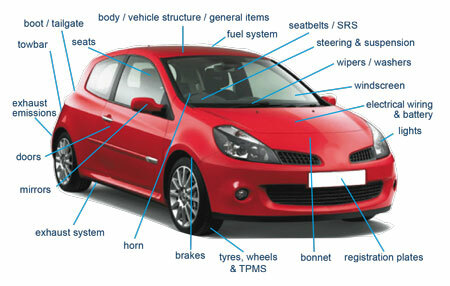 Body / vehicle structure / general items: Free from excessive corrosion or damage in specific areas. No sharp edges likely to cause injury. Towbars for security / condition / inappropriate repairs or modification. Correct operation of 13 pin electrical socket. Speedometer condition and operation. Engine mountings. Fuel System: No leaks. Security and condition of pipes / hoses. Fuel cap fastens and seals securely. Note: the fuel cap will need to be opened. Make sure the key is available. Exhaust emissions: Vehicle meets the requirements for exhaust emissions, dependent on the age and fuel type of the vehicle. Exhaust system: Secure. Complete. Catalyst missing where one was fitted as standard. Without serious leaks and is not too noisy. Seat belts: All the seat belts fitted are checked for type, condition, operation and security. All mandatory seat belts must be in place. Check of the Malfunction Indicator Lamp (MIL) for air bags and seat belt pre tensioners and load limiters. Seats: Drivers seat for adjustment. All seats for security and seat backs can be secured in the upright position. Doors: Latch securely in closed position. Front doors should open from inside and outside the vehicle. Rear doors should open from outside the vehicle. Hinges and catches for security and condition. Mirrors: Minimum number required, condition and security. Indirect vision devices. Load security: Boot or tailgate can be secured in the closed position. Brakes: Condition including inappropriate repairs or modifications, operation and performance (efficiency test). Note the removal of the road wheels and trims are not part of the test. Anti-lock Braking System (ABS) and Electronic Stability Control (ESC) where fitted. Check of the dashboard Malfunction Indicator Lamp (MIL) for ABS, ESC, electronic park brake and brake fluid warning. Tyres and wheels: Condition, security, tyre size/type and tread depth. Spare wheels and tyres are not inspected. Note: vehicles first used on or after 1 January 2012 - check of the MIL for Tyre Pressure Monitoring System (TPMS). Registration plates: Condition, security, colour, characters correctly formed and spaced. Lights: Condition, operation including High Intensity Discharge (HID) and Light Emitting Diode (LED) headlamps for cleaning, self-levelling and security. Headlamp aim. Main beam warning light. Bonnet: Securely latches in the closed position. Wipers/washers: Operate to give the driver a clear view ahead. Windscreen: Condition and driver’s view of the road. Horn: Correct operation and of suitable type. Steering and suspension: Condition, steering oil level, operation, a check for inappropriate repairs or modification including corrosion to power steering pipes or hoses. Operation of steering lock mechanism. Check of the MIL for electronic power steering and steering lock. Electrical: Visible electrical wiring and battery. Note: An MOT certificate confirms that at the time of the test, without dismantling, the vehicle met the minimum acceptable road safety and environmental standards required by law. It does not mean that the vehicle is roadworthy for the life of the certificate. The test does not cover the condition of the engine, clutch or gearbox. The new van guide provides much needed advice and principles to help raise maintenance standards for the light goods vehicles (LGV) sector. With 50% of vans or LGVs failing their MOT test year on year it’s clear that things have to change. The new Your van: best practice guide will give much needed best practice principles to help raise the standards of these vehicles throughout Great Britain. With input and support from key stakeholders, this is a useful reference point for people who use vans not only for business but also for private hire. The guide includes an operator and driver checklist along with a diagram of a van walk around check. The aim is to encourage a culture of compliance leading to a reduction in MOT failures and an improvement in the prohibition rate.